Before Lamar Jackson becomes the face of the NFL’s next generation of quarterbacks, he had to endure games like his first start in the playoffs. That Jackson was able to win six of his first seven starts with a gimmicky offense that his coach admitted he “didn’t know where it was headed” as it evolved, speaks volumes about his talent as a playmaker and less about his ability to become a championship quarterback. However, his fourth quarter performance with the game out of reach personified why he is the face of the Baltimore Ravens’ future. Jackson picked the wrong time to play his worst game as the Ravens starting quarterback. He was as culpable as anyone for Baltimore’s demise against the Los Angeles Chargers in the AFC Wildcard Game at M&T Bank Stadium, but there needs to be some temperance brought to the argument about whether Jackson is a franchise quarterback. All quarterbacks – especially rookies – struggle in their first postseason start. It’s a rite of passage that accompanies the ascent up Vince Lombardi Mountain that Joe Flacco once scaled. “The greatest quarterback in franchise history” will always be revered for his Super Bowl MVP season and three AFC Championship game appearances although his first playoff game was anything but legendary. Those who called for Flacco and booed Jackson in the fourth quarter, forget the outgoing Ravens quarterback completed only nine of 23 passes for 135 yards against the Miami Dolphins. It was a team that was built to play defense and run the football. They rushed for 151 yards behind Willis McGahee and the immortal Le’Ron McClain while forcing five turnovers against a team that introduced the ill-fated, short lived “wildcat offense” that was ultimately faster than a Kevin Spacey Netflix series before it revolutionized pro football. Jackson didn’t play like a future hall of famer by any stretch. One day before his 22nd birthday he played nervous. Three fumbles, including the late game turnover that sealed their fate, will be the peripheral mosaic that fans take from the game. He passed for only 17 yards in the first half often looking dazed like a prize fighter who came to his corner after taking a standing eight count. 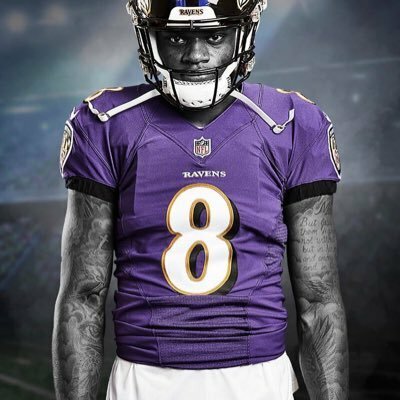 However, Jackson must carry the blame for being overwhelmed by his first postseason moment, but the Ravens game plan didn’t put Jackson into a position to succeed either. The arrogance of their ignorance to maintain the same philosophy that worked three weeks earlier in Los Angeles was preposterous although seven penalties and a missed Justin Tucker field goal also helped dig a hole too deep to climb from. Harbaugh continues protecting offensive coordinator Marty Mornhinweg, who remained committed to a rushing attack the Chargers adjusted for after seeing it previously. Los Angeles’ head coach Anthony Lynn and defensive coordinator Gus Bradley committed to stopping it with seven defensive backs, two linebackers, and three linemen all game. Mornhinweg had no answers to help the rookie quarterback succeed. They dared Baltimore to throw and they couldn’t while he was forced to stay in the pocket early on. Jackson passed for 17 yards in the first half and had only 30 into the fourth quarter. He was 11 of 19 for 169 yards two touchdowns over the game’s final 9:23 after they allowed him to make plays outside the pocket despite a pedestrian group of receivers with average running backs nearly led them back from a 23-3 fourth quarter deficit. Teams don’t win championships organizations do. The Chargers exposed the Ravens championship warts and it’s now up to the front office to build a better team around Jackson.